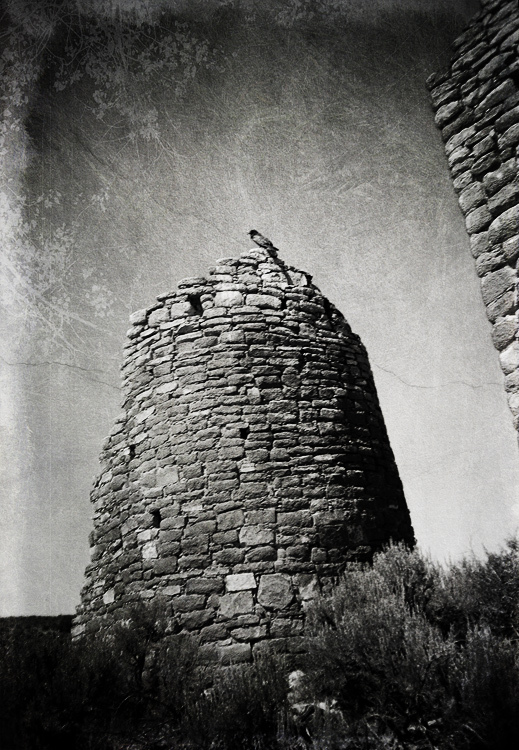 A Raven stands guard over Hovenweep National Monument, UT. Ansco Shur-Shot JR., Ilford 100 film with some Photoshop work. Nice textures. Love the raven. Thanks for your comment on my blog. You have a beautiful website here. You're pictures are also Beautiful. I like this, the Canyon sunset and the 4th of July mountain the best. the tiny bird looks to be the subject of the picture 🙂 i love this so much, i'm big on textures!!! The raven adds to the mood of this mysterious looking monument. Excellent details and textures. Great image, i like the processing and the composition! Excellent work! It looks a little like the iron age Pictish Brochs in Scotland. Hreast texture blending. Love the mood you've captured/created here. Perfect in b&w! Love all the grain and the desolate mood. Beautiful shot! nice to see someone else using an Ansco. i like the mood in this one very much. the place and scene feel ancient. i love the textures shown on this! Quoth the raven…. Hmmm. A poem is in the making here! Perfect use of textures. Dull ambience. The sky is fascinating. Great work! I really like the texture here, and the raven on top of the ancient structure is perfect! nice old look and textures! beautiful. really like the textured look. Wonderful that you were able to capture the bird there. great bw, really nice captured. superb use of texture…imparts a lot of atmosphere into the shot.